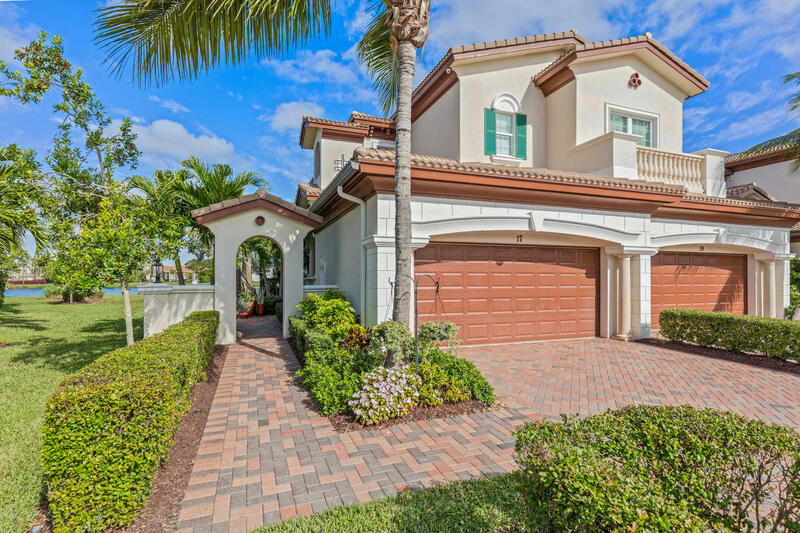 Stunning Jupiter Country Club upgraded Aviano model home with designer upgrades & built-ins galore. 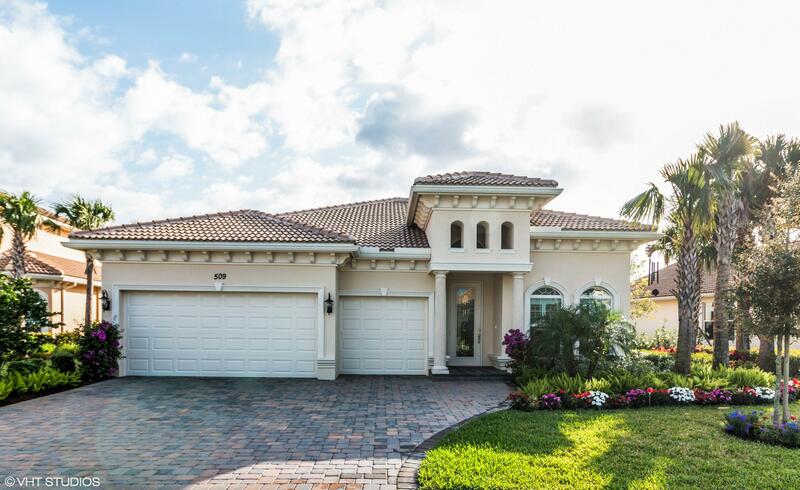 3 bedroom 2.5 bath plus den and 3 car garage Mediterranean style home offers salt-water pool, lake and golf views. From custom crafted built-ins to added windows, no detail has been spared in this design-packed home. The gourmet kitchen features an open floor plan, double-height cabinetry, additional windows, extended and enlarged island, quartz countertops, backsplash, soft close cabinetry, stainless steel appliances, 6 burner gas stove, butler's pantry, and designer upgrades. The living room, dining room, and entry areas have exclusive handcrafted custom-made solid Maple built-ins. Exceptional former model home on premiere South facing lot is Move in Ready! 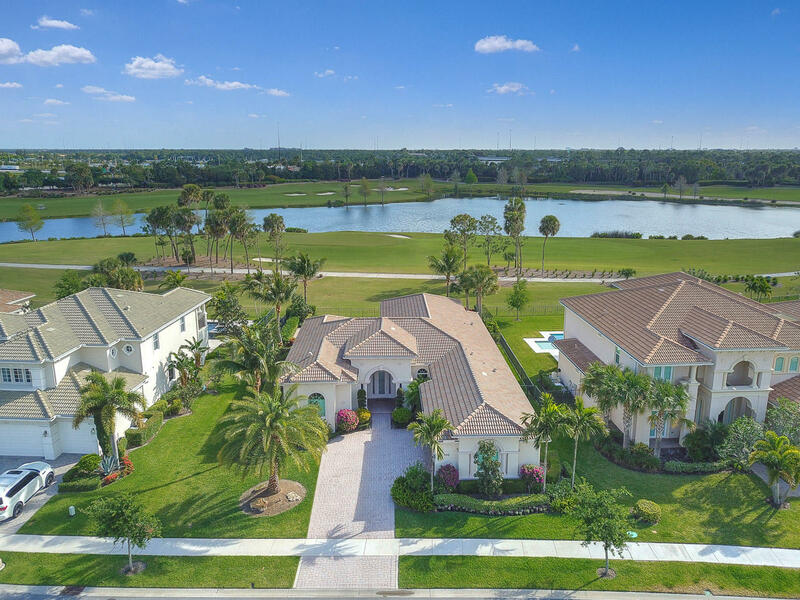 Enjoy the finest in Country Club living in Jupiter's Newest golf community featuring a Greg Norman course + resort amenities. 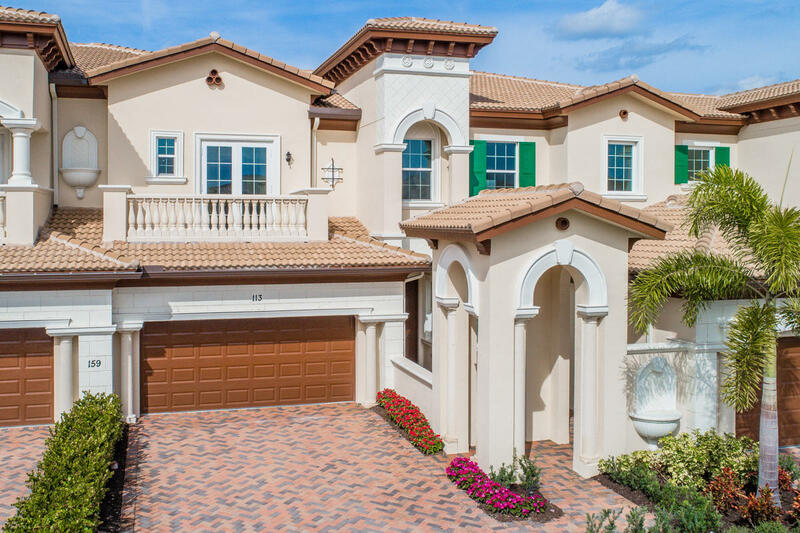 This impeccable Casa Vincenza model is a best selling floorplan, offering grand scale rooms with an abundance of natural light. This home offers a contemporary flair and open design, great for entertaining. All windows/doors are premiere Impact and home has natural gas. Energy efficient! Downstairs Master BR is very private and has luxe bath + 2 walk in closets. Grand staircase leads to spacious loft, 2 large bedrooms + 2 BA upstairs. 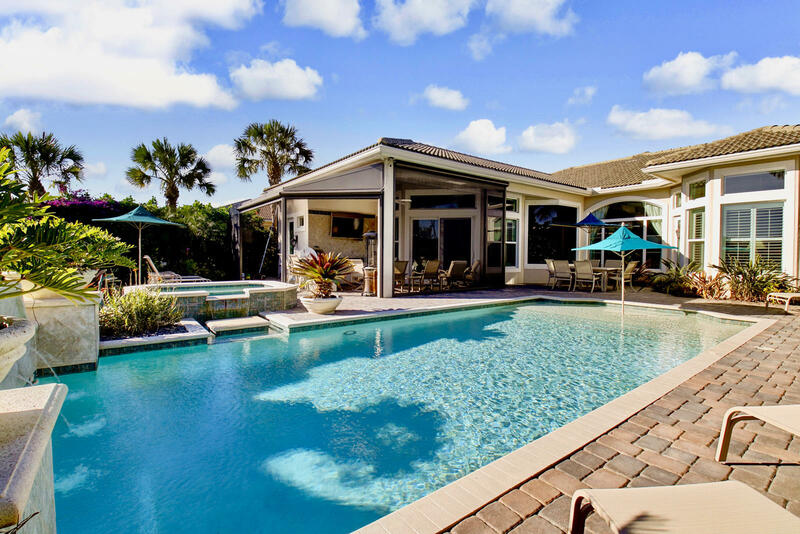 Gorgeous Outdoor space, Pool w/ Spa, summer kitchen...Golf views. Fabulous sport amenities! Minutes to beaches, shopping, dining, A rated schools! 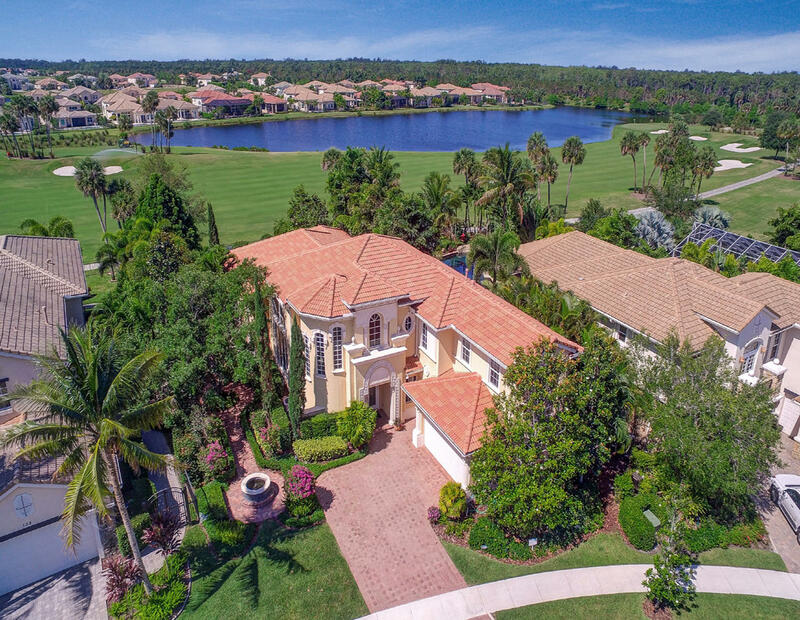 Experience one of the greatest views that beautiful Jupiter Country Club has to offer. This 5 bedroom / 5.1 bath sits on Gregs Norman's signature golf course on the 3rd fairway, and of course this property also comes with a golf membership! This 2016 Carina Model home includes the top of the line upgrades Toll Brother's has to offer. Including an extended 3 car garage plus golf cart space that is fully air conditioned and panoramic windows looking out to your own tropical oasis! This open floor plan features his and her master baths, marble flooring, an iron spiral staircase, and gorgeous custom crown moldings throughout the home. 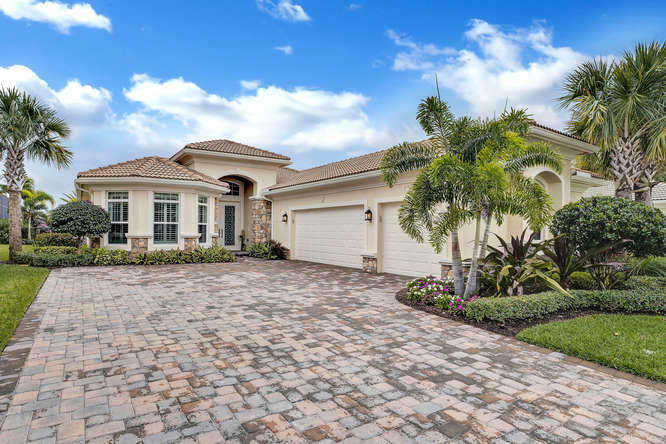 Listed by, Sutter & Nugent Inc.
4 bedroom 4 bath Castania pool home, spa with very private landscaped yard and view of 15th green.Screened outdoor kitchen with remote screens and flat screen TV. Full house generator. Home has upgraded kitchen cabinets, granite and appliances. 5 burner gas range. Stunning Fully Furnished Turn Key Ground Floor 3 Bed / 2.5 Bath Carriage Home. Gorgeous Lake & Golf Course Views. Open Modern Chefs Kitchen with Granite Countertops & Stainless Steel Appliances. Large Living Room, Separate Dining Area. Spacious Master Bedroom with Lake & Golf Course Views, Large 2nd & 3rd Bedrooms. 2 Covered Screened-In Patio/Lanais. High Ceilings Throughout. Full 2 Car Garage with an Extended Driveway. 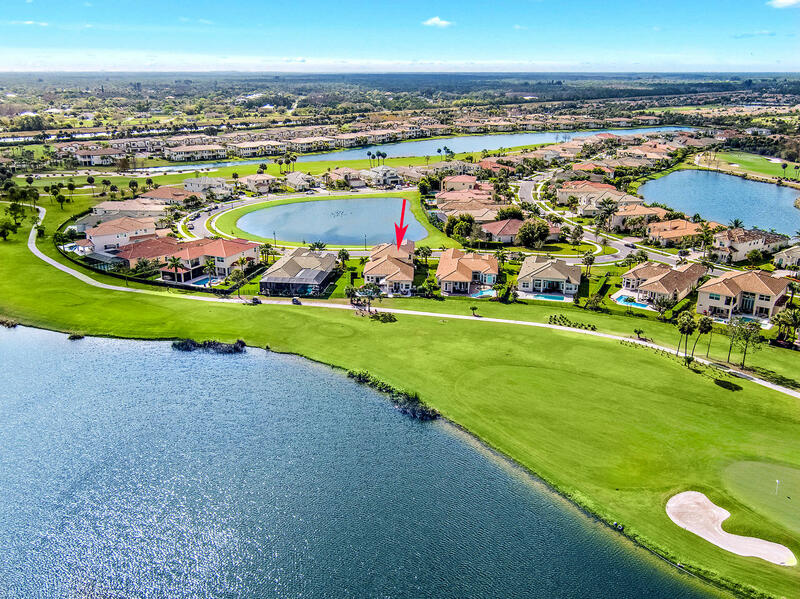 Enjoy all the World Class, Resort Amenities of the Jupiter Country Club. Minutes from the Airport, Beach and the Downtown Shops & Restaurants.